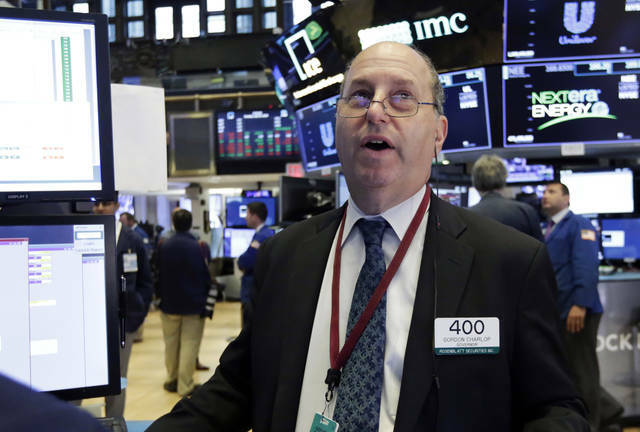 NEW YORK (AP) — The major U.S. stock indexes finished mostly higher Tuesday as investors welcomed strong corporate earnings reports from Google parent Alphabet and other companies. Gains by technology companies and health care stocks outweighed losses in consumer goods manufacturers, retailers and other sectors. Smaller-company stocks, which have been beating the rest of the market this year, turned sharply lower as investors weighed the implications of the Trump administration’s decision to send billions in emergency aid to farmers hurting from tariffs stemming from the U.S. trade dispute with China. Tariffs also weighed on Whirlpool’s latest quarterly results, giving the appliance maker its worst day in more than 30 years. “Investors are focused on the good news on earnings and the economy, but they’re still a bit cautious when it comes to the market moving higher, and that’s because of all the news flow on geopolitical events and tariffs,” said Jeff Kravetz, regional investment strategist at U.S. Bank Private Wealth Management. The S&P 500 index rose 13.42 points, or 0.5 percent, to 2,820.40. The Dow Jones Industrial Average gained 197.65 points, or 0.8 percent, to 25,241.94. The Nasdaq composite lost 1.11 points to 7,840.77. The Russell 2000 index of smaller-company stocks had its worst day in a month, sliding 18.22 points, or 1.1 percent, to 1,680.20. More stocks fell than rose on the New York Stock Exchange. The S&P 500, the market’s benchmark index, is on a three-week winning streak. Alphabet gained 3.9 percent to $1,258.15 after the company reported second-quarter earnings late Monday that topped Wall Street’s expectations, even as it booked a $5.1 billion charge to cover a fine levied by European regulators. Harley-Davidson vaulted 7.7 percent to $44.63 after the motorcycle manufacturer’s latest quarterly earnings came in well ahead of what analysts were expecting. The company also said it’s planning strategic changes as tariffs affect its business. Health care sector stocks got a lift from a couple of companies that reported strong quarterly results. Biogen added 4.1 percent to $372.84. The drugmaker also raised its forecast for the year. Shares in Eli Lilly & Co., which in addition to reporting solid earnings said it will spin off its animal health business, gained 5 percent to $93.35. This is the busiest week for the second-quarter earnings season, with roughly a third of companies in the S&P 500 scheduled to report, including Amazon, Facebook, Boeing and Ford. Of the 17.4 percent of the companies in the S&P 500 that had issued quarterly results as of Monday, some 71 percent reported earnings and revenue that beat analysts’ forecasts, according to S&P Global Market Intelligence. That’s reinforced the underlying perception in the financial markets that the U.S. economy is performing strongly and that the Federal Reserve will raise interest rates again next month. Even so, traders remain wary of global trade tensions, which have ratcheted up in recent weeks as the Trump administration has sought to renegotiate trade pacts with China, Canada and European nations, resorting to imposing tariffs on imports of aluminum, steel and other goods. The strategy has prompted U.S. trading partners to retaliate, creating risks for the economy. On Tuesday, the Trump administration announced a $12 billion plan to assist farmers who have been hurt by President Donald Trump’s trade disputes with China and other trading partners. The plan, which focuses on Midwest soybean producers and others targeted by retaliatory measures, would include direct assistance for farmers, purchases of excess crops and trade promotion activities aimed at building new export markets. The move sent shares in several agriculture sector companies higher. Farming equipment manufacturer Deere & Co. rose 3.2 percent to $139.84. Fertilizer maker Mosaic added 2.3 percent to $29.02. The aid plan also prompted the sell-off in small-company stocks, which tend to be more domestically focused and had climbed in recent months as the dollar got stronger and investors worried about trade. Those conditions changed after the White House proposed its aid package, said Quincy Krosby, chief market strategist at Prudential Financial. “Seeing the government offer aid to the farmers perhaps has given the market a bit of a belief that if any other sector or subsector that gets hurt temporarily by these ongoing trade issues, perhaps they too will receive aid,” she said. Whirlpool isn’t expecting much relief from the impact of U.S. tariffs on steel and aluminum imports. In a filing, the company blamed higher raw materials costs on the tariffs, and said it expects more of the same in the second half of 2018. That could require Whirlpool to modify its business practices and could have “a material adverse effect on our financial statements in any particular reporting period,” the company said. Investors hammered Whirlpool’s shares Tuesday. The stock tumbled 14.5 percent to $128.82. Bond prices rose. The yield on the 10-year Treasury fell to 2.95 percent from 2.96 percent. Benchmark U.S. crude climbed 63 cents, or 0.9 percent, to settle at $68.52 per barrel in New York. Brent crude, used to price international oils, gained 38 cents to $73.44 per barrel in London. The pickup in oil prices helped lift energy sector stocks. Pioneer Natural Resources added 3.2 percent to $187.08. The dollar fell to 111.22 yen from 111.48 yen on Monday. The euro weakened to $1.1683 from $1.1689. Gold slipped 10 cents to $1,225.50 an ounce. Silver added 10 cents to $15.52 an ounce. Copper gained 6 cents to $2.81 a pound. In other energy futures trading, heating oil rose 1 cent to $2.13 a gallon. Wholesale gasoline was little changed at $2.09 a gallon. Natural gas added a penny to $2.73 per 1,000 cubic feet. Markets in Europe finished solidly higher despite a survey that indicated economic growth across the 19-country eurozone moderated at the start of the third quarter. Germany’s DAX rose 1.1 percent and the CAC 40 in France added 1 percent. The FTSE 100 index of leading British shares gained 0.7 percent. Major indexes in Asia also finished higher. Japan’s Nikkei 225 gained 0.5 percent, while South Korea’s Kospi added 0.5 percent. Hong Kong’s Hang Seng jumped 1.4 percent. Australia’s S&P-ASX 200 rose 0.6 percent.